On ESXi host optics diagnostic is not implemented. I have found that ethtool in linux has the option -m which displays optic diagnostic information but ESXi ethtool do not support it. Monitoring Switch Port SFP/QSFP Hardware Information Using ethtool in Cumulus linux is described here. During the research, I have found that linux -m option reads these diagnostic information from EEPROM. On ESXi host, we can dump EEPROM by following esxcli command. Memory maps are described in specification SFF-8472 available on multiple places around the Internet. Two 256 bytes memory maps are described in SFF-8472 Specification but the problem is how to locate these maps in EEPROM dump which has, in this particular case (Intel X520) 4,080 bytes. The most interesting part of the dump from text (ASCII) perspective is the part between 0550h and 05E0h. There are adapter model and vendor name but it seems to me that it does not fit into the memory maps defined in the SFF-8472. Therefore I do not know how to find optic (SFP) diagnostic values in EEPROM memory dump. 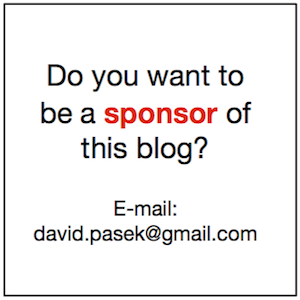 If you have any idea if I am in the right track and how to continue, please let me know. 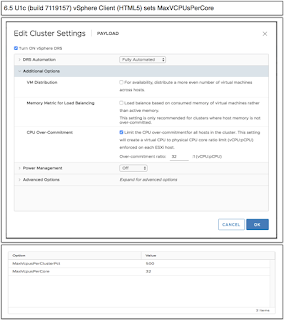 Before vSphere 6.5 we have to monitor it externally by vROps or some other monitoring tool. Some time ago I have blogged how to achieve it with PowerCLI and LogInsight - ESXi host vCPU/pCPU reporting via PowerCLI to LogInsight. It is worth to mention a little bit tricky setting of these additional options via GUI. It is good to know how GUI setting of "CPU Over-Commitment" is mapped to DRS cluster advanced options. 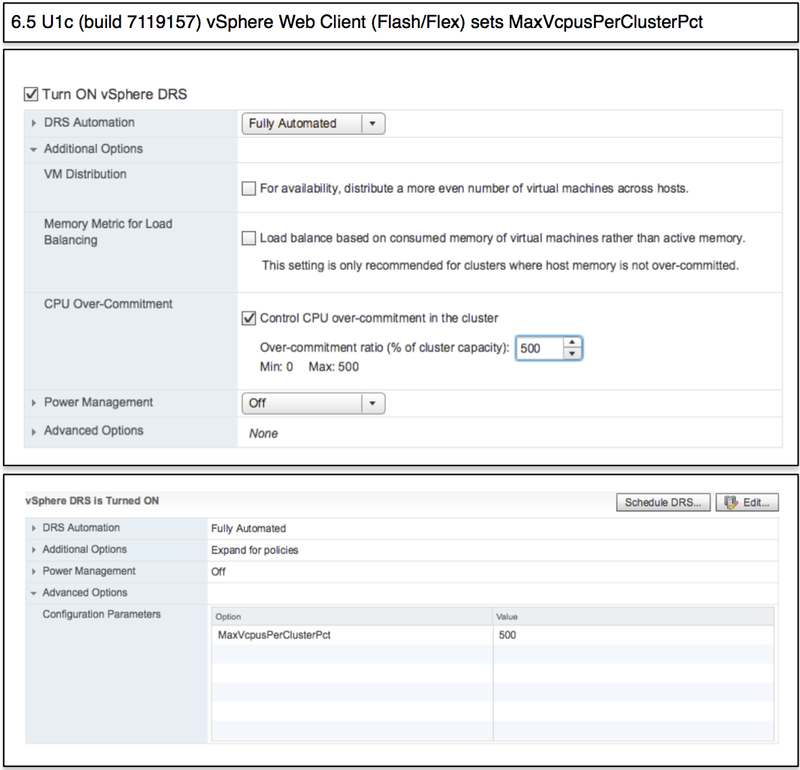 If I set "CPU Over-Commitment" in vSphere Web Client (Flash/Flex) it sets MaxVcpusPerClusterPct so it is the setting per the whole vSphere Cluster. So this is how it should work. Now let's do some test to understand real behavior. Let's set MaxVcpusPerClusterPct to 0 so we are saying to allow 0 : 1 vCPU / pCPU ratio. In other words, no VM can be running in the cluster. And it works as expected. When I try to run VM I get the error "The total number of virtual CPUs present or requested in virtual machines' configuration has exceeded the limit on the host: 0". Well, it is a little bit misleading because it should be cluster-wide rule but it works as expected. Let's set MaxVcpusPerClusterPct to 100% so we are saying to allow 1 : 1 vCPU / pCPU ratio. 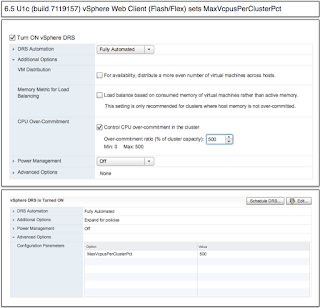 I have 4 node DRS cluster where each ESXi host has two cores (pCPUs), therefore I have 8 pCPUs available in the cluster. And I can really start only four VMs because each has 2 vCPUs so I can run up to 8 vCPUs in DRS cluster. 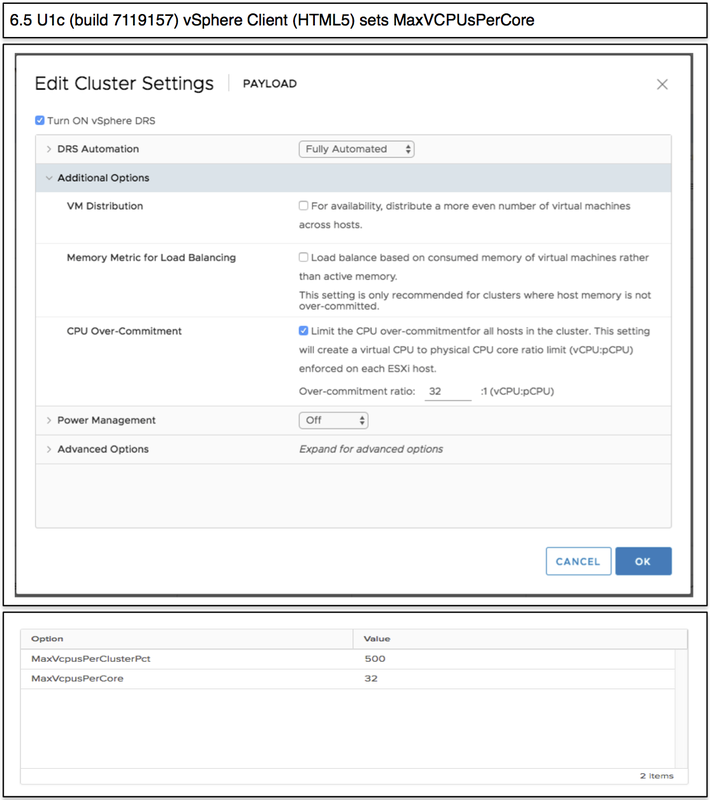 It is great, but it is worth to mention that VMs were started on single ESXi host even I have 4 ESXi hosts in DRS cluster. So vCPU / pCPU ratio is compliant per cluster but not per ESXi host as I have 8 vCPUs on single ESXi hosts having just 2 pCPUs. But that's expected behavior. So far so good. Let's set MaxVcpusPerCore to 0. My expectation was that I will not be able to start any VM but that was NOT the case. I was able to start a lot of VMs and exceed the expected vCPU / pCPU ratio. This is unexpected behavior. Let's set MaxVcpusPerCore to 1. My expectation was that I will not be able to start more than 2 vCPUs per ESXi host so only one VM with 2 vCPUs. Unfortunately, I was able to start much more vCPUs per ESXi host. This is again unexpected behavior. So, let's set MaxVcpusPerCore to 4. I have prepared nine VMs with 4 vCPUs each and my expectation is that I will not be able to start more than 8 vCPUs per ESXi host so only two VMs with 4 vCPUs per ESXi host. And because I have 4 ESXi hosts per cluster I should be able to start the maximum of 8 VMs. UPDATE 2018-04-20: The issue with MaxVcpusPerCore is fixed in vSphere 6.5 U2. This is written in Release Notes: The advanced vSphere DRS parameter MaxVcpusPerCore might not work as expected and the desired ratio of virtual CPUs per physical CPU or core will not take effect in configurations below 4:1. MaxVcpusPerCore supported ratios now start from 1:1. 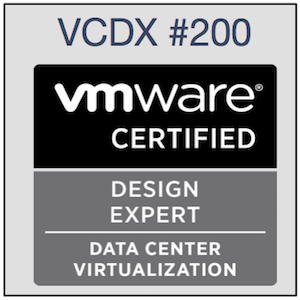 Advanced DRS setting MaxVcpusPerClusterPct supports values between 0 and 500 and represents percentage between vCPUs and pCPUs across the whole DRS cluster. If the value is higher then 500, enforcing does not work. So, vCPU / pCPU percentage ratio can be enforced between 0:1 to 5:1. vCPU:pCPU ratio 0:1 is a special setting where no VM can be PowerOn on vSphere Cluster. This is little bit risky setting but it can be used to put the whole cluster in kind of "maintenance mode" and forbid anyone to run VMs there.